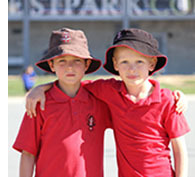 “Caring Striving Learning Together” embodies a partnership of school and excellence in all endeavours, within a warm and caring association of students, staff, parents and community. Aranda Primary School opened in 1969. The suburbs of Aranda, Bruce (west of Hayden Drive), and Cook ( a shared enrolment suburb) are the priority enrolment areas. The strong ethos of community support is a major feature of Aranda Primary School. The School has a high level of parental involvement in school programs and the Parent & Citizen (P&C) Association. In addition to strong community commitment and support, the school has a reputation for its academic achievements, environmental awareness, comprehensive arts and physical education programs. The suburbs and streets of Aranda are all named after Australian Aboriginal language groups. The school emblem reflects this Aboriginal theme, while the school’s motto is an Aboriginal phrase “Marima Ergurirai” which means, “Grasp the things that are good”. The Aranda are a language group from the Macdonnell Ranges area of the Northern Territory. They have been one of the most closely studied of all Aboriginal groups and have also produced a number of well-known painters including Albert Namatjira. A display of prints highlighting the work of Albert Namatjira is located in the Admin corridor leading to the Library. The Aboriginal way of pronouncing Aranda is "ur-run-dta". 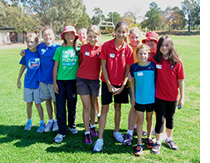 Aranda Primary promotes the study of Aboriginal history and culture.